Sita comes from Naya Guan in Bardiya District, in southwestern Nepal. She is a member of the Tharu people, an indigenous minority group that originally inhabited the Terai forests and grassy plains in the Chitwan area. For centuries, the Tharu’s natural immunity offered protection from malaria and outsiders, but after the World Health Organization helped the Nepal government eradicate malaria in the Terai forests, settlers came to claim the fertile lands. In following decades, the Tharu were forced off their traditional lands and into bonded labor. Today, they continue to struggle to gain democratic rights, including access to education. When not in school, Sita works alongside her family in the rice fields. But she also loves to dance and participates in traditional Tharu festivals and whenever she has a chance. 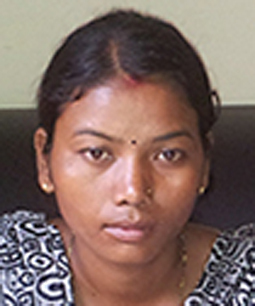 Sita is pursuing a three-year bachelor of education program at Babai Multiple Campus in the Bardiya district. Her goal is to teach children from traditional cultures who come from poor families in remote, undeveloped communities.